Maidenhair ferns are as fine and delicate as their name implies. They are one of the most exquisite foliage plants for shady gardens, but require a gardener's tender touch to grow well. Maidenhair ferns belong to the genus Adiantum, of which there are several commonly grown species. As a whole maidenhair ferns are characterized by silky, finely cut foliage and black stems that create a striking visual contrast to the deep green leaves. They are typically a diminutive plant, reaching no more than 12 inches in height with delicate needle-thin stems that are easily broken. Maidenhairs are intolerant of direct sun, thriving in indirect or filtered light, high humidity and rich, moist soil. They are a common forest species throughout the world, usually found near water and sometimes found growing from the cliffs alongside waterfalls. They are an excellent species for massing around well-shaded water features, though they make a nice potted specimen where their beautiful foliage can be view up close. 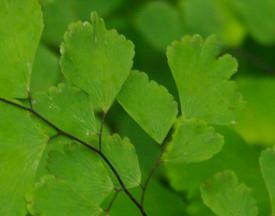 Some species of maidenhair are used as indoor plants, as well. The most important difference among the various species of maidenhair is their degree of cold tolerance. 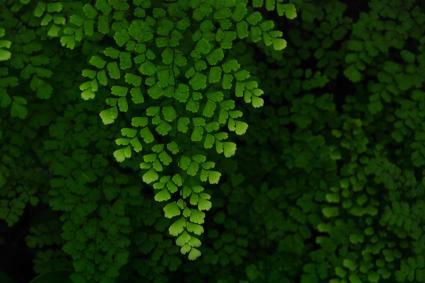 Peruvian Maidenhair (Adiantum peruvianum) is one of the most popular of the tropical species, commonly grown as a houseplant, but is not frost-hardy outdoors. Southern Maidenhair (Adiantum capillus-veneris) is native to California and the southern United States where it tolerates temperatures to about 10 degrees. Evergreen Maidenhair (Adiantum venustum) is the most cold-hardy variety that does not die to the ground in the winter, tolerating temperatures down to -10 degrees without losing its fronds. One variety does have additional differences beyond cold tolerance. 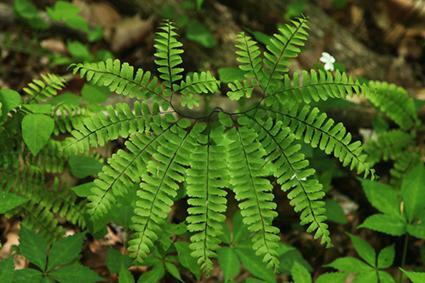 The Northern Maidenhair (Adiantum pedatum), also known as five-fingered fern, is the only species that is hardy outdoors throughout North America. Its leaf structure differs from the other varieties in that the leaves are structured along five stems that radiate out from the larger stem that grows from the ground. It is a deciduous variety that grows slightly larger than the other species with a more coarse appearance, commonly reaching 18 to 24 inches in height. Before planting maidenhair ferns, enrich the soil with copious quantities of compost to provide the nutrient content and spongy texture they need. The soil needs to stay consistently moist, but not soggy. 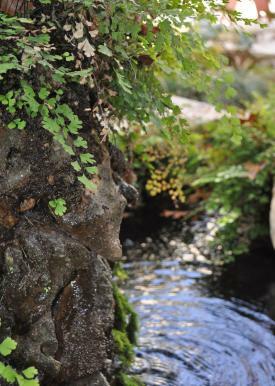 An irrigation system is convenient with a plant like maidenhair fern, as they may need water daily in the heat of summer. Over time, they will spread underground to form a lush groundcover, though they are not considered invasive. Maidenhair ferns grow very well in pots with a typical soilless potting mix providing the ideal growing medium. This arrangement allows them to be grown outdoors on a patio or deck for the warm months and then brought indoors for winter. Inside, they tend to suffer from dry air and respond well to being misted on a daily basis with a spray bottle. The only maintenance with maidenhair ferns is the periodic removal of dead fronds. For the species that go dormant in the winter, it is fine to cut them completely to the ground - they will re-sprout the following spring. Pests are rarely an issue with maidenhair ferns, but they are quite susceptible to powdery mildew, especially when grown indoors. There is not a lot that can be done for plants affected with this fungal pathogen, other than to keep in mind that it is typically a result of poor air circulation or too much shade. They shouldn't be in a sunny window, but they do need indirect light when grown indoors. There are few plants as feminine and fine-textured as maidenhair ferns. They're not the easiest plants to grow, but in the right conditions they will form a lush carpet of green in the shade of large trees.